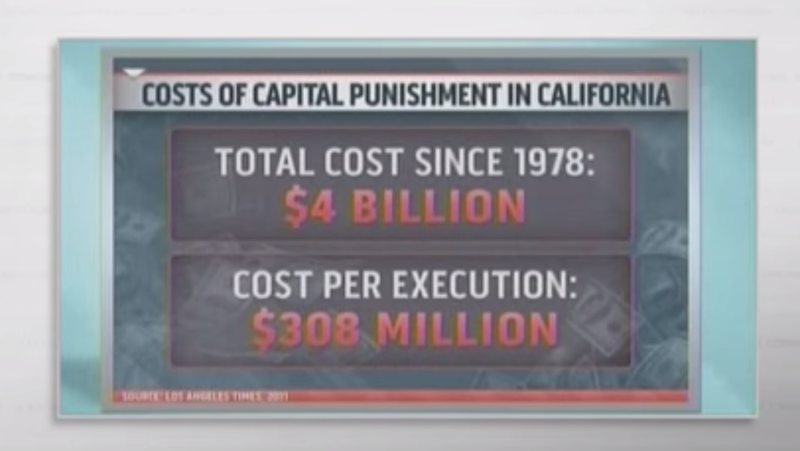 Costs of capital punishment in California. That image sources "Los Angeles Times, 2011". Taxpayers have spent more than $4 billion on capital punishment in California since it was reinstated in 1978, or about $308 million for each of the 13 executions carried out since then, according to a comprehensive analysis of the death penalty's costs. The study counted "the additional costs of capital trials, enhanced security on death row and legal representation for the condemned" and found that these "added $184 million to the budget each year". The study referred to by the LA times, and the ultimate source of this claim is Executing the Will of the Voters? : A roadmap to mend or end the California legislature's multi-billion dollar death penalty debacle, by Alarcon and Mitchell, 2011.
abolishing capital punishment and replacing it with a system that imposes a sentence of life without the possibility of parole for those now eligible for the death penalty would reduce the costs now incurred by the state of California from $137.7 million per year to $11.5 million per year. To help understand where some of the excess cost of the death penalty system comes from, see the California Commission on the Fair Administration of Justice Final Report. Among other things, it mentions an Indiana study that found "the cost of a death penalty trial and direct appeal alone is more than five times the cost of a life without parole trial and direct appeal". There is no right to appointed council for habeus corpus petitions in life without parole cases. If instead of discretionary death penalties there were mandatory life without parole sentences, there would be no appeal available based on ineffective council during the sentencing phase. Also, in the graphic in question, "Cost per execution" is not what the actual physical execution of an execution costs. It is the cost of the program divided by the number of executions that have happened. Do teachers make more per hour on a career basis than doctors?